The design is advancing in Europe on a large set of components—electrical feedthroughs—that will be installed at the barrier between the air atmosphere outside the vacuum vessel and the ultra-high vacuum environment on the inside. Some of the design variants for the diagnostic feedthroughs that will allow electrical signals and power to pass through the vacuum vessel wall without compromising the vacuum inside of the machine. IDOM (Spain) is the Fusion for Energy contractor that has developed the preliminary design of the components. The feedthroughs will service diagnostic and instrumentation clients inside of the vessel, allowing electrical signals and power to pass without compromising the vacuum inside the machine. Clients include almost all of the diagnostics and instrumentation systems mounted on the vacuum vessel inner wall, the divertor cassettes, or the diagnostic racks of the lower ports, and which have electric signal transmission or power requirements. A number of requirements make these components particularly challenging to design—the large number of client systems (each with different requirements for their transmission chain); the nuclear environment—both in terms of radiation dose and safety regulations for protection-important components (PIC); the strict requirements on materials and leak rates to maintain ultra-high vacuum conditions; and the fact that the feedthroughs have to be installed before First Plasma but operate throughout the four phases of the machine without maintenance. Many of these challenges have previously been achieved in isolation, but ITER brings them all together for the first time. Based on a Procurement Arrangement signed with the ITER Organization in 2017, the European Domestic Agency Fusion for Energy is responsible for the procurement of more than 70 diagnostic feedthroughs. It is working closely with IDOM (Spain) on this project, and recently the preliminary design was approved during a formal review process by a panel composed of staff from Fusion for Energy and the ITER Organization. Electrical feedthroughs for ultra-high vacuum usually consist of an array of metal pins sealed into a disc using a glass-to-metal or ceramic-to-metal seal—with one barrier or wall between the vacuum and the air. IDOM's approach is to use two glass-to-metal seals—one at each end of a metal pin—with an interspace between the seals. This creates a double wall or double barrier between the vacuum inside of the ITER machine and the air atmosphere of the port cell interspace, which answers to both safety and vacuum requirements. The interspace volume between the seals can be monitored to detect any leaks while the double wall provides increased reliability and defence in depth. 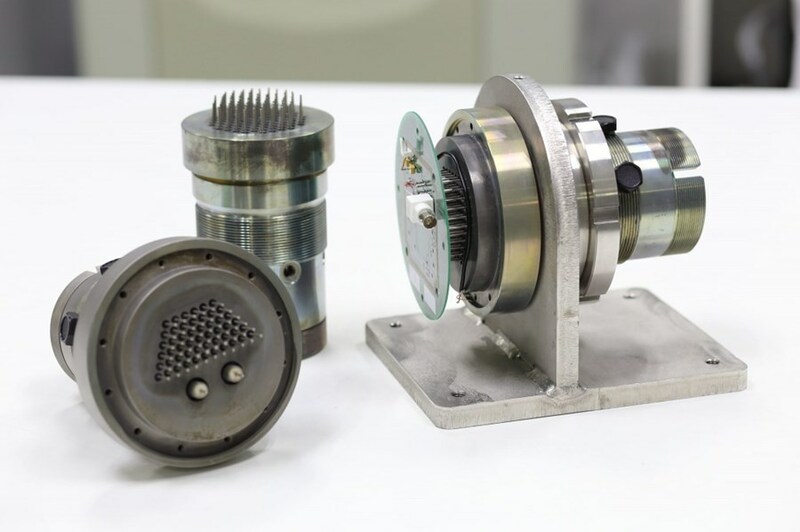 "These feedthroughs are responsible for carrying almost all of the thousands of electrical signals through the ITER vacuum vessel's first safety boundary," says Michael Walsh, head of the ITER Port Plugs & Diagnostics Integration Division. "Their reliability is very important to our mission. We are delighted to see the good progress in the work." The next step will be to develop a fully qualified final design. Please see the original report on the Fusion for Energy website.